Post that don’t fit into the other categories. Welcome to my warehouse. I was finding that my studio was so packed with wonderful things to tempt you that I did not have space to work. I was becoming afraid of being crushed in an avalanche. So my husband and I have been trying to come up with a way to easily increase my storage space. My nephew found me a used Job Sit Trailer. 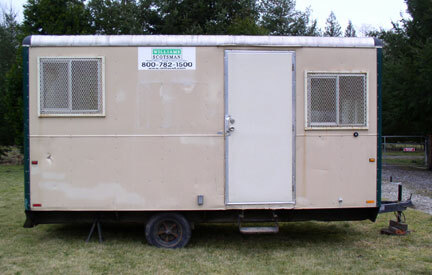 One of those mobile offices that you would find at construction sites. 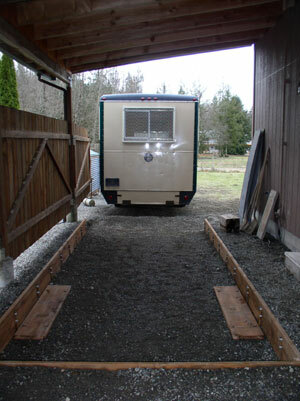 This one was a reasonable price, with some elbow grease,a few repairs and some dirt work it is moved in and usable. My husband calls it either my shack or my Hobbit Hole, I think of it as my Pop-Up Warehouse. I am still getting everything situated inside, but it sure made life easier during my Spring Dash of Quilt Shows. I finally had all my inventory in one place and could restock quickly and easily before dashing off to the next wonderful quilt show. Here we are moving the warehouse into its new home. Please note that I will only consider comments written in English. My reasoning is if I do not know what it says I will not approve it. Yes, I do read every comment before approving it. It there is even a hint of the stink of spam it will be deleted. For those of you that really do read my blog, I do welcome comments. I am sorry for the hoops I am forced to make you jump thru but it does help keep the spammers at bay. Q: Do you sell your Hand Marbled Fabric by the yard? I make the majority for the fabric in Fat Quarters 18″ x 22″ With a few pieces in Fat Half sizes 22″ x 36″. Each piece of fabric must be gently lowered onto the marbling base in one fluid motion. The larger the piece of fabric the more chance of things going really wrong. The higher the rate of spoilage the higher the price. Q: How can I learn to hand marble on fabric? I learned to hand marbled on fabric from a book. I found “Creative Marbling on Fabric” by Judy Simmions while at a Quilt Show in Alaska. In my opinion this is the best book for learning to marbled on fabric, as that is the main focus of the book. Greatfor beginners. Good resources for supplies are Dharma Trading and Pro Chemical. Q: Do I teach hand marbling on fabric? On rare occasion. I am happy to say the making hand marbled fabric, keeping up with my web site, blog and shows have been keeping me very busy. Freeing up enough time to teach is getting harder and harder, but I do teach ocasionally for groups. Their is an online Marbling Yahoo Chat group they you may want to check with to see if you can find someone teaching in your area. I am happy to say that I have been very busy selling wonderful fabric to very wonderful quilters and fiber artists. If you have been trying to look at the photos on my blog, you know that they have disappeared. Somewhere in all the changes they went away. Well, I found them and finally figured how to get them back. Please be patient as it takes a little time, but the will reappear over the next few days or so. So not only do you offer gorgeous fabrics at very fair prices, you include shipping in the yardage price, you have very fast fulfillment on the orders placed, AND YOU RECALCULATE AN ORDER TO SAVE ME $1.01 when you didn’t have to do that!! Pat is a member of Marbled Arts monthly email Newsletter. We promise not to fill your inbox with junk mail. Once a month we let you know about new fabric & goodies, show dates and locations, sales or special events. You can sign up at info@marbled-arts.com We promise not to sell, rent, trade, give, share or distribute your email address. I hate SPAM ac much as you do. I also live in the land of dial-up, (as do many of you) so I do not include fancy graphics and photos, just links to the good stuff. It never ceases to amaze me how life can get in the way. I hope to have some projects posted soooon. But in the until then, I finally cut my hair. I was able to send over 15 inches of hair to Locks of Love. I am still getting used to much less hair and its so light weight. I do feel a bit like I have dropped of the face of the blogging earth. But I am very busy adding new items to my web site. So far African Sun Prints closeout (get them while they last), Hand Made Earrings. Still to add Girl’s Night Out Bags and a couple of Samples that are For Sale. I am also experimenting with Shiva paint sticks on silk scarves and some new Hand-dyed fabrics. So stay tuned! Well, I will admit that my husband is finally home so i am also spending quality time with my man.